I've been picking locks for around 2.5 years. 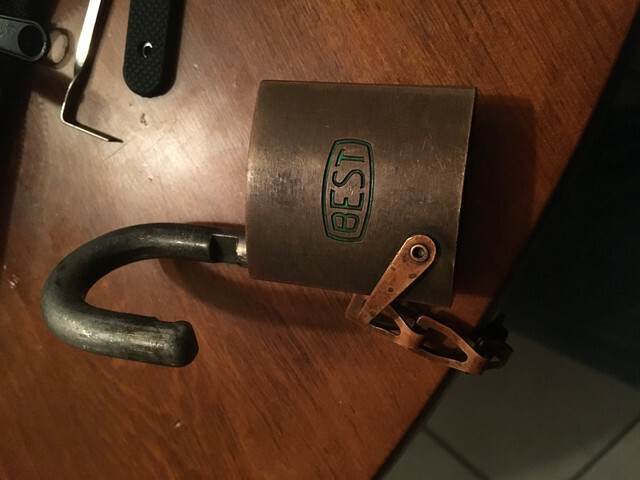 After I got my first few locks open, my dad gave me my first BEST, a 7 pin, with no keys. He said "pick this and make some keys". It was pretty worn but I figured it should still work fine. A few months later I managed to rake it open only twice, after what I'm sure was at least 20-30 hours of trying. Since February 2017, I have probably put another 30 hours in and haven't even gotten it open again, let alone to control. I tried the IC tension wrenches. I tried a bump key (it's an F keyway). I've tried SPP. Nothing seems to work and I want to get it to control. The only thing I've noticed is that when I tension and rake, in order to reset the pins I have to fully turn the wrench counter clockwise. Just releasing tension will get all but a couple of pins to drop. Only when I go all the way counter clockwise do the last one or two pins drop. I even asked BosnianBill and he told me the IC wrenches are junk and to try over lifting, but I can't get that to work either. No matter how much I try over lifting or how much tension I use, pin 1 will never set - it won't even bind - and always drops back down. I mean, if I've picked it open it has to set at some point. 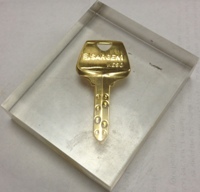 Anyway, I'm rambling like a madman because this lock has made me one. Is there any reason an IC would be able to open but never to control? Are there any tips someone could give? My dad has since told me to cut the core out but to me that's giving up. I have blanks as well as the tools to take the core apart but I just need it out of there. Without pictures, it sounds like the core is still in the housing. Is it in a handle, mortise cylinder? You could try drilling a small hole in the side of the housing and use a small wire to put pressure on the control lug. Depending on how old it is and who pinned it it could have spools in it. It could very likely also have a collapsed spring(s) in it. Many people still use the copper springs and it takes almost nothing to make those collapse. Thanks guys. I was wondering about the springs too. How do collapsed springs affect a lock? Drilling a hole is a good idea, but still a last resort. If a spring is collapsed you don't have that downward force which affects feedback, pins that are not set might still be contained by ever so slight binding pressure or in a lock that old even the tack of old WD-40 and dirt could keep a pin from coming back down. mdc5150 wrote: If a spring is collapsed you don't have that downward force which affects feedback, pins that are not set might still be contained by ever so slight binding pressure or in a lock that old even the tack of old WD-40 and dirt could keep a pin from coming back down. Thank you. Now I'm even more curious to see. Maybe I'll sleep on the drilling and think about it. Do these locks tend to require heavier tension? I can't remember what I used when I got it open, as I didn't expect it. If the link attached works, it should take you to an article that may have some information that helps. Oh great, thank you so much! I'm sure this will help. also check out the Matt Blaze article on SFIC. Some good info. jeffmoss26 wrote: also check out the Matt Blaze article on SFIC. Some good info. That one I have read but it's been a few months. I will reread. Thank you! Personally when I try picking to control I use heavy top of the keyway tension. Thanks again guys. I spent maybe around 9 hours this weekend on that damn lock. I guess I'm gonna shelve it for another month, come back, read all of this again and give it another go. I appreciate all the input.